phrase to phrase as well as with an eye on the larger architecture of the poem; each line, each sentence is put together with a good deal of care for the springy rhythm, the arresting image and---most of all, perhaps---the unusual word." 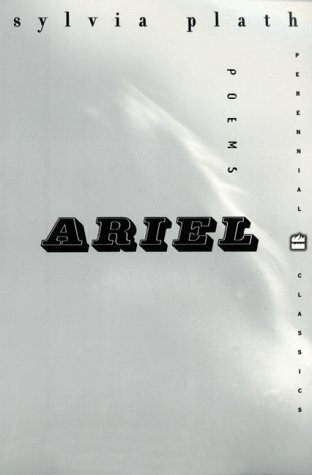 Plath's second book of poetry, Ariel, written in 1962 in a last fever of passionate creative activity, was published posthumously in 1965 and explores dimensions of women's anger and sexuality in groundbreaking new ways. Plath's struggles with women's issues, in the days before the second wave of American feminism, became legendary in the 1970s, when a new generation of women readers and writers turned to her life as well as her work to understand the contradictory pressures of ambitious and talented women in the 1950s. The Bell Jar---first published under a pseudonym in 1963 and later issued under Plath's own name in England in 1966---is an autobiographical novel describing an ambitious young woman's efforts to become a "real New York writer" only to sink into mental illness and despair at her inability to operate within the narrow confines of traditional feminine expectations. Plath was posthumously awarded the Pulitzer Prize for poetry in 1982. In recent years, there have been a number of biographies and critical evaluations of Plath's work. intellectualized religious symbolism and a savage satire against the materialism of modern American life. Lowell won the 1947 Pulitzer Prize for poetry for "Lord Weary's Castle" (1946), in which religion was beginning to fade as a source of his symbolism. In "Life Studies," which won the National Book Award for poetry in 1960, he offers portraits of his New England relatives through whom he studies himself and his origins. It was with this volume that critics began to speak of Lowell as a confessional poet. For the "Union Dead" (1964), another collection, continued the exploration of his own and the United States' past and present. Among Lowell's other prizes were the Harriet Monroe Memorial Prize (1961) and the 1962 Bollingen Prize of $2,500, which he shared with Richmond Lattimore, for "Imitations." Lowell was also well known for his active political concerns. Bitterly opposed to the Vietnam War, he caused a sensation in 1965 when he rejected a White House invitation to appear at a festival of the arts. In his letter to President Johnson, he wrote: "Every serious artist knows that he cannot enjoy public celebration without making subtle public commitments." He demonstrated against the war (notably with Norman Mailer at a vast gathering at the Pentagon in 1967), spoke repeatedly in favor of peace, and accompanied Senator Eugene McCarthy during his antiwar campaign for the 1968 presidential nomination. Lowell's thoughtful and visionary genius was clearly a response and a challenge to his times, as well as a reflection of deep-seated historical anxieties. The poetry of Lowell's late period, especially the "Notebook" (1969) volumes, portrays the agonies of failed heroic values and the debilitating effects of historical irony. This late poetry shows how all of Lowell's idealism was an inescapable struggle, with only tenuous victories. The self-consciousness and autobiographical shorthand of his final volume, "Day by Day" (1977), give off an uncanny glow of sadness and weary acceptance fitting for a person who was the leading poet of his generation.